If you need to locate your Bob-Cat model number and serial number, we can help! Find your Bob-Cat equipment below to see model and serial number locations. 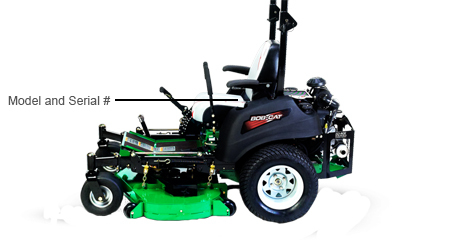 The serial number on Bob-Cat walk-behind mowers can be found on the back of the mower deck in front of the engine. Find your Bob-Cat Walk-behind Mower Parts. 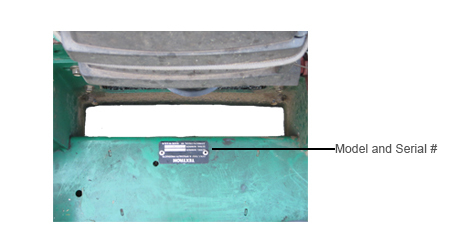 The serial number plate on a Bob-Cat zero turn mower can be found on the cross member of the frame, under the operator seat. It can also be found on the left side panel near the cut-off switch (not shown). Find your Bob-Cat Zero Turn Mower Parts.